This feature allows you to add, edit and delete a sponsor ad to your member portal and also to your public website for website templates that have a vertical menu along the left side of the page. This feature can also be used to add a banner image to the top of the member portal. If using a public website template with a horizontal menu, you can simply add the sponsor image to where you like on the page. 2. 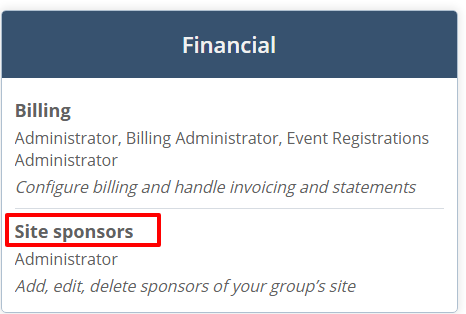 Under Financial, select the Site sponsor(s) category. In the red Administration bar, click the Add Club Sponsor tab to the right. 2. Complete the needed information in the Create Club Sponsor window. 3. To upload banner images, click the Choose File button. Select the desired image and click the Open button. If you need to edit an image so that it is the correct size, use an image editor like Pixlr (pixlr.com). This feature allows you to add more than one sponsor ad. If you have more than one sponsor ad for the same time, the images will rotate. Edit or update information of existing club sponsors. 1. In the grid, locate the sponsor that you would like to edit and click the edit icon. 2. Edit information of a club sponsor in the Edit Club Sponsor window. 1. In the grid, locate the sponsor that you would like to delete and click the trash icon. 2. Remove sponsor by clicking the Delete button in the Delete Club Sponsor window.